Foregrounds can often be a pain in the neck, and are often not considered properly until the rest of the painting has been completed. This is not good practice, of course, as it’s by far a lot better to give the foreground some thought before you start painting. Anything but the simplest of landscapes will benefit from one or two studio thumbnail sketches to help you decide on the main features and relationships of the composition. Foregrounds vary considerably, and sometimes completely different types of foreground may well suit a scene. 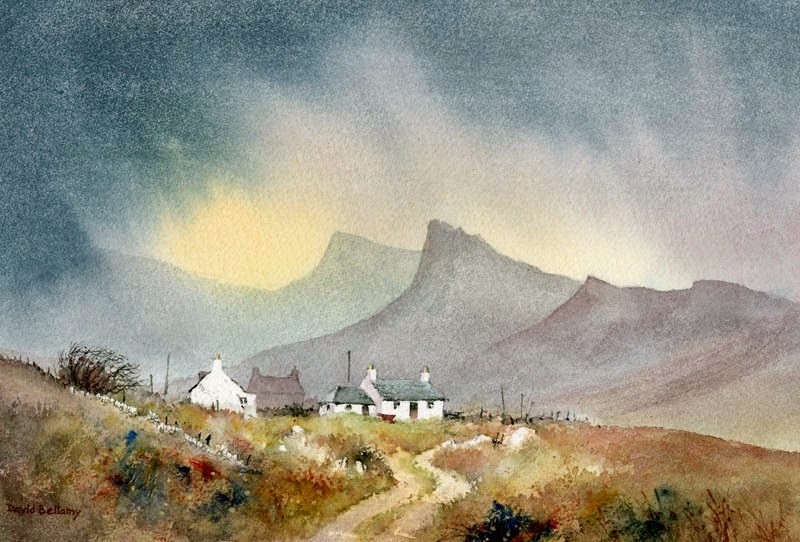 Having a lead-in to the focal point can be very effective, and in this watercolour of cottages on Skye the track undulates and wriggles, losing itself in places until it disappears completely round the right-hand side of the buildings. A lead-in doesn’t have to be continuous, and there are times when it helps to be less conspicuous. The warm colours in the foreground here counter the cool ones in the distance, accentuating the sense of space, although I have mashed some strong blues into the foreground vegetation with a spatula in places to create interest. I used the edge of a piece of card to apply the paint here and there – this introduces a change of style from the brushwork, tending towards the abstract. Drystone walls, posts and boulders can be useful for breaking up masses of vegetation. Experiment with all sorts of objects with which to apply the paint if you’d like to try something new. On a hike recently I wanted to find a spot where the river created a really good lead-in to a mountain, but there was no path. The dense vegetation simply got worse as I battled upstream (without a machete – they don’t like you carrying them around these days, and my Swiss Army knife wasn’t quite up to the job). If, rather than fight it, you wish to paint such dense vegetation, then the semi-abstract system as in the bottom left of this painting, can be the best option. Enjoy your painting/hacking! This entry was posted in Abstract foregrounds, aerial recession in landscape paintings, atmosphere, David Bellamy, foreground by David Bellamy. Bookmark the permalink. David as always so interesting and inspiring . Could you please at some point in the future cover protecting whites on paper. I have tried masking but it just doesn’t stand out enough to make an impact especially against a light sky eg a lighthouse. I use a bockingford paper usually. Thank you for the post. thank you for your reply David I knew it was going to be tonal but I often find this difficult so I am glad you will something soon as I don’t always want a dark sky to bring out the lighthouse so I look forward to your post thanks for taking the time to comment. Love your work. Moving to Builth Wells end of September and cant wait to explore the wild landscapes there.